On April 30, 2009 the EN 15194 standard for Electronically Power Assisted Cycles (EPAC) was officially announced by the National Standards Boards (NSBs) of 30 countries (27 EU member states and Iceland, Norway and Switzerland of the European Free Trade Association). On April 30, 2009 the EN 15194 standard for ‘Electronically Power Assisted Cycles’ (EPAC) was officially announced by the National Standards Boards (NSB’s) of 30 countries (27 EU member states and Iceland, Norway and Switzerland of the European Free Trade Association). To qualify an e-Bike as ‘perfectly safe’ for the user as well as his surroundings, it has to comply with this new standard. 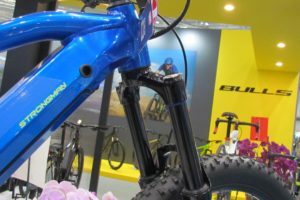 There is a great interest in this new European Standard, which will influence the booming European e-Bike market substantially. Why? It will change the market for e-Bikes drastically as it will no longer be possible to enter the e-Bike market in Europe by simply importing e-Bikes from China and selling them on. These days an e-Bike with smooth running pedalling assistance is a sophisticated electric machine. All modern electrical equipment, including the e-Bike, has its own product Directive. These Directives cover product aspects such as the environmental impact of the materials used, product safety, Electro Magnetic Compatibility (EMC) and low voltage characteristics. The new European standard EN 15194, aimed at safety and reliability, will classify all Directives and become the new standard for all e-Bikes. To qualify an e-Bike as ‘perfectly safe’ for the user as well as his surroundings, it has to comply with this new standard. In this new standard the CEN (European Committee for Standardisation) has drawn up the technical, environmental and safety requirements to qualify an e-Bike. In a very comprehensive test program an e-Bike is examined mechanically as well as electronically to the interest of the environment, health and safety of the user and his surroundings. The self-certification within the industry is not foolproof and does not give the owner the guarantee he is entitled to. With that the image and the healthy future of the e-Bike are at stake. In order to guarantee a reliable product and the provision of correct information to the consumer, it is up to the e-Bike industry to implement this new EN 15194 as the standard. The standard has to imply quality, reliability and safety. For the consumer this should be all well and good. But the reality with e-Bikes is far more complicated. Electric bikes contain a complex system of several electronic parts and components forming a drive system. The various parts each have to have their own CE-mark and be integrated with each other and similar equipment. For example like battery chargers for mobile phones and iPods. Mixing different components from several brands might lead to short-circuiting or worse. The same problem is lurking for e-Bikes. Putting all the components together does not guarantee high quality and maximum safety of the final product. 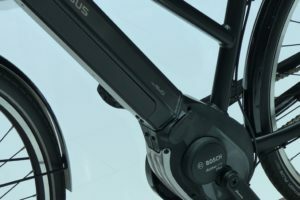 An e-Bike can lay a claim to a CE-mark only if the final product, including all the individual electronic components has been produced according to the EN standard. 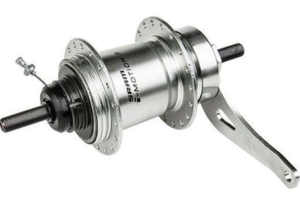 The EPAC standard is far more complicated than the CEN standard we know for bicycles. 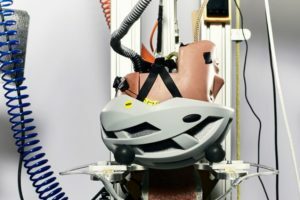 Manufacturers can do the CEN testing for standard bikes themselves. That is not possible for EPAC. It is too complicated as it is not about testing separate components. 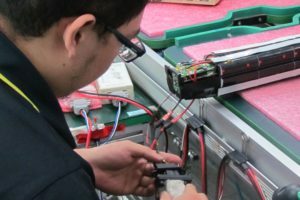 To meet the EPAC/EMC standard you have to test the whole system or sub-assemblies and you have to do that again and again after each minor adjustment. Electro Magnetic Compatibility (EMC) is a good example of the importance of the new EN standard. 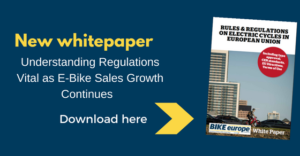 Although the consequences are not fully realized throughout the market, EMC requirements are already applied throughout Europe to all kinds of electric appliances and vehicles including e-Bikes. EMC is one out of many parts of the CE test procedure. By the way, the EMC requirements are already in force throughout Europe, including all the e-Bikes that are currently on the market. Electro Magnetic Compatibility requirements are designed, for instance, to ensure the safety of people who use a pacemaker or hearing-aid when driving cars or e-Bikes. In our world full of electronic equipment it is of utmost importance that any interference between electric equipment is limited. Everybody knows that you have to switch off your mobile phone in an airplane during take-off and landing. Can you imagine what will happen if a non-certified e-Bike interferes with a passer-by’s pacemaker? A non-certified e-Bike is not only dangerous for the driver, but also for his environment. The future for the e-Bike is looking bright. The industry will benefit from stable quality and a positive image that comes with the EPAC standard. However, at the same time it will only work as everybody and every e-Bike supplier will comply to it. The complete document with all the technical requirements as well as all the test procedures of this new standard is now available at the National Standards Boards of the following countries: Estonia, Latvia, Malta, Ireland, Austria, Sweden and Slovenia. The price for the complete document stands at about €70. The National Standards Boards of the other 20 member states of the 27 countries that form the European Union, as well as the three European Free Trade Association countries will have the EN 15194 document available before July 31st 2009. As it stands now the EPAC standard will, contrary to the CEN Safety Standards for bicycles, not be published in the Official Journal of the European Union and with that come into force. The EPAC standard comes into force with the publication by the National Standards Boards. This means that the EPAC standard is now already in force in Estonia, Latvia, Malta, Ireland, Austria, Sweden and Slovenia where the National Standards Boards have published them. At all other countries the EPAC standard come it force when the National Standards Boards publishes it. As said that publication must take place before July 31st 2009. According to Chairman Siegfried Neuberger of the CEN Technical Committee 333 that next to standards for bicycles also handled the EPAC standard, the legal status of EN 15194 is a bit lower compared to the CEN standards for bicycles in reference to the General Product Safety Directive (GPSD) of the European Union. 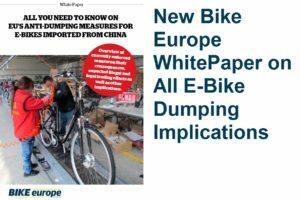 To get the EPAC standard on the same harmonised European Norm level as with the standards for bicycles, committee chairman Neuberger says the European Committee for Standardization entered into discussions with the European Commission. With that the publication in the Official Journal of the European Union could follow on a later date. Sixth months after the EPAC standard announcement all the European and EFTA National Standards Bodies will have implemented the EPAC standard as national standard and any previous national standards shall be withdrawn before this date. This date is July 31st 2009. The implementation of the EPAC standard varies by country. In some European countries it is compulsory by law. These countries are (as far as Bike Europe knows at this moment) France and the UK. In other countries it is part of the European product safety ruling. January 14th, 2009 was the date when the definitive text for EN 15194 was sent to all European and EFTA National Standards Bodies and was accepted by them. Sixth month after the acceptance of the definitive text all European National Standards Bodies will have implemented the standard as national standard and any previous national standards shall be withdrawn before this date. This date is July 31st 2009. The date of announcement for the standard is April 30th, 2009. The standard will be announced by the European National Standards Bodies and the text of the complete EN 15194 standard for ‘Electronically Power Assisted Cycles’ (EPAC) will be available at the National Standards Bodies in the various European countries. The implementation of the CE standard varies by country. The EPAC standard comes into force when the National Standards Boards publishes it. As said that publication must take place before July 31st 2009. In some European countries the CE standard is compulsory by law, while in other countries it is just a part of the European product safety ruling. The electronics of an uncertified e-Bike have the potential to harm the driver as well as other electronic equipment. Each separate component of an e-Bike has to comply with the CE-standard and has to carry a CE mark. The fulfilment of the CE standard and using the CE marking is the responsibility of the manufacturer and/or the importer.